By accident, as a matter of fact. There was a time when I strongly resisted writing a series. I liked standalone mysteries, but mostly I was afraid of getting into a rut, writing about the same character in book after book. The market rewarded series better than standalones, but still I held out. Then my next mystery was The Renewable Virgin, in which three characters take turns telling the story. One of those three was Sgt. Marian Larch. Since the plot concerns goings-on behind the camera in the television biz, that meant I needed to set the scene in either Los Angeles or New York. I chose New York, because I know it better. 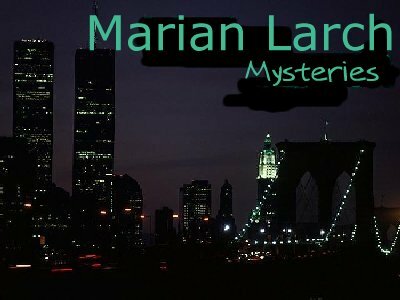 So Marian Larch was to come from the NYPD to investigate the murder. I had no further plans for her after that one book. The next book was He Huffed and He Puffed. In that one, the action moves around the country a bit -- but when the murder finally takes place, it happens in New York. That meant I needed a New York investigator again. Why not bring back Marian Larch? I thought: Maybe I can fool people into thinking I'm writing a series! Marian doesn't appear until the final third of the book, but she dominates that third. Something very much like that happened in the next book as well, Good King Sauerkraut. The action starts in Pittsburgh but moves to New York, where a police investigator is needed. This book is a "reversal" -- that is, the reader knows right from the start who the guilty person is. In this story I kept very close to the point of view of the title character, King Sarcowicz. The reader sees Marian only as King sees her...as a menace, a threat to his liberty. At that point I had to do some serious thinking. Here I'd used the same investigator in three mystery novels...and I was still pretending I wasn't writing a series? Well, now. Marian is present only a third of the time in Virgin and He Huffed, and the only view we get of her in Sauerkraut is that of a man who is preoccupied with staying one step ahead of her. It dawned on me that I owed Marian a book of her own. So I gave her one. You Have the Right To Remain Silent is all Marian...what it's like to be a working cop, her personal life, her angst from having to deal with departmental politics, her bouts of depression springing from the kind of work she does. I also gave her the most complex case she'd ever yet had to solve. And it's in Silent that Marian first meets Curt Holland, a man with whom she enters into a prickly, tenuous relationship that never does run completely smooth. The Apostrophe Thief begins on the very morning after the action of Silent ends. The two books together tell one story: Silent shows Marian sinking into her own personal Slough of Despond, and Thief shows her pulling herself back out again. At the end of Thief Marian makes a decision that affects both her professional life and her love life. And Fare Play shows the results of that decision. But in Full Frontal Murder, Marian is no longer able to keep her two lives separate; a criminal she is hunting invades her private life in a way that changes Marian forever. Since Marian is based in New York, I've been bringing in characters from other books of mine set in New York, building up a "family" of characters around Marian. Marian became friends with Kelly Ingram, the title character of The Renewable Virgin, so Kelly is present in the last three books. I added playwright Abigail James and actor Ian Cavanaugh from The Fourth Wall. And from Kill Fee I brought in Lieutenant James Murtaugh of the NYPD and promoted him to Captain. Also, I've undertaken to write one short story for each of the secondary characters in the series. So far three are done -- stories for Kelly Ingram, Gloria Sanchez, and Curt Holland. The titles are the last three listed above, following "Making Lemonade". Several readers have asked me how I chose a name for my series character. At the time she first began to take shape in my mind, I didn't know my cop was going to turn into a series character. But I think I'd have chosen the same name even if I had known. In The Renewable Virgin (Marian's first appearance) I was planning to have one character who always got her name wrong...deliberately so, as an insult. So I needed a first name that lent itself to error-making. "Marian" let me have him call her Miriam, Marilyn, Mary Ann. As for the last name...at the time I was starting Virgin, I happened to watch a rerun of an old Alfred Hitchcock episode in which a character actor named John Larch appeared. "Larch" sounded right -- it was short, easy to spell, easy to pronounce. Marian Larch. Yep, that would do just fine. last updated on October 28, 2000.